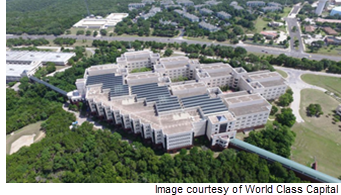 ​​​​​​​​​ AUSTIN – World Class Property Co. has closed on the purchase of 3M’s 1.3 million-sf campus in far Northwest Austin. The campus sits on 158 acres off RM 2222 and RM 620 in Austin’s high-tech corridor. It features a main building complex of offices, labs and an innovation center, as well as nature trails and walking paths. The campus can reportedly be expanded to over 3 million sf through future development. 3M, known for making Post-it notes and Scotch tape, will continue to occupy the site until 2019. However, World Class plans to immediately market space to new tenants.